Two teams of Cal Poly business students took second and third place in the structural design portion of the Association of Independent Corrugated Converters (AICC) Student Competition. 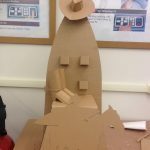 The students were challenged with using corrugated fiberboard and other paper materials to create a family of products that would help their university recruit new students. 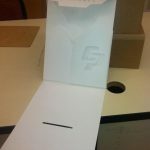 The guidelines required that each team develop a floor display, a mailer and shipper to hold promotional materials, and a welcome kit to organize giveaway items for new students. Projects were judged on creativity, durability, ease of assembly and marketability. Cal Poly students took second place with their project called “SLO Skyline.” Industrial Technology and Consumer Packaging majors Ikaika Valasco, Andrew Morey, Emily Mallett and Patrick Salibi incorporated the iconic hills of San Luis Obispo throughout their cardboard series of products, in addition to the Cal Poly logo and mustang mascot. Their project’s 57-inch-tall display accommodated tablet computers to display animated messages and allow students to sign up for emailed collateral to reduce waste. Students received a $250 cash prize and plaque for permanent display. The “SLO Skyline” products will go on to the International Corrugated Packaging Foundation’s (ICPF) “Best of the Best” Student Design Presentation Competition. Students will be able to pitch their entry before a panel of industry professionals at the ICPF’s Careers in Corrugated Teleconference for additional cash prizes. Third place in the AICC competition went to the “The Surfing Cowboy” project produced by Nicole Hermann, Gregg Yasuda, Victor Sanchez-Zapata and Alyssa McPadden, all of whom are students in the Orfalea College of Business. 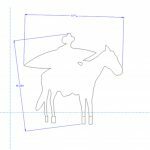 The team blended the figures of cowboy on horseback and a surfer together to represent Cal Poly’s balance between agricultural curriculum and beach town lifestyle. The group’s six-foot display also featured a wearable cowboy hat and spur-clad boots that adorned the brochure inserts. Supporting collateral included a mailer that could be reused as a folder for collateral pieces. Students received a $150 cash prize and plaque. The AICC also awarded Catlin Khamashta $1,000 from the J. Richard Troll Memorial Scholarship to support her education in Industrial and Packaging Technology at Cal Poly. The scholarship is an annual award for three undergraduate and one graduate student majoring in packaging engineering or a related packaging field. Khamashta’s essay regarding her goals in the packaging industry took second place in the scholarship competition. 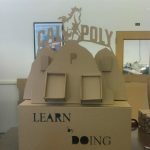 Cal Poly’s Packaging Program has been recognized by AICC in the past for its creative corrugated fiberboard packaging projects. It has placed in the top two during six of the last nine years of student competitions. In 2007, 2008, 2009 and 2012, Cal Poly students took home the “Best of the Best” distinction from the ICPF.